Rimini is one of Italy’s older areas, boasting a history that began in 268BC when the Romans built the city. The 2,000-year history of Rimini can still be seen in many aspects of the city, as well as in the surrounding region of Emilia-Romagna on Italy’s northeast. The Flaminian Way, the Popilian Way, and the Aemilian Way all traveled along this area, filling it with trade and commerce that added flavor and culture to Italy’s Adriatic coast and fanned out inland to the Apennines. Because of the rich history of Italy’s northeast, getting a Rimini motorhome rental or campervan hire in Italy to explore the Adriatic coast is one of the best ways to experience the area. Another great reason for investing in a campervan hire in Rimini is due to the fact that much of modern Rimini has become a major tourist attraction. While there are plenty of local sites that are worth seeing, if you’re looking to experience true Italian culture and life, you’ll want to get outside of the touristy resort areas and see how the locals live, and where the history took place. It is also important to note that a Rimini motorhome rental gives you the opportunity to easily venture out to the coast, or toward the inland areas without having to worry about public transportation, accommodations, or the safety of your belongings. While in Rimini’s downtown area, be sure to check out some relics and remnants of its ancient history by visiting the Augustus Arch built by the Romans in celebration of Emperor Augustus. Another interesting site is the Domus of the Surgeon. This area is actually an archeological site, and it displays about 20 centuries of Rimini’s long and multi-layered history. The Tiberius Bridge is another historical site, and was built by the Romans in order to set a landmark to the doorway to the Aemilian Way traveling road. For something a little more unique and strange, check out the Tempio Malatestiano, a burial chapel that was built for the Sigismondo Pandolfo Malatesta family who were the lords of 15th century Rimini. When you’re ready to jump out of the city, start off close by venturing down to the Adriatic coast. Rimini has an excellent coastal community, and there is nearly 15 kilometres of prime beachfront landscape to lounge on. If you’re there during the summer, you’ll notice a lot of shops, photo ops, and cultural events occurring along the beachfront. You need not compete for space, however; there are a couple of campgrounds close by that will make an ideal base for your campervan rental or motorhome hire. 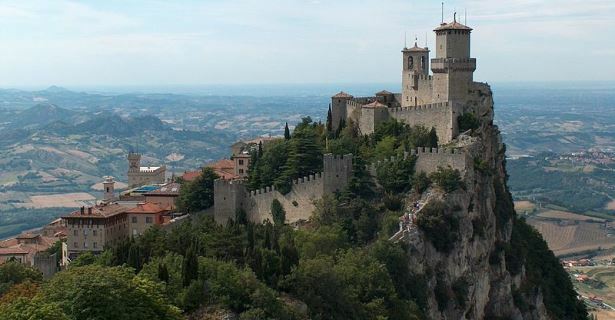 No trip to the Rimini area is complete without a trip to San Marino, less than 30 minutes southwest by Rimini motorhome rental. San Marino is the oldest republic in Europe, and to make the aesthetic value of this trip even better, it is located high up on a hill, giving it the perfect view of the region around it. San Marino also gives visitors the option of going up into one (or all) of its three towers. These towers were once used to watch for enemies; now they give visitors an amazing vantage point by which to see both San Marino and the Adriatic coast. After leaving San Marino, check out Florence, which is only two and a half hours west, so it makes a perfect day trip by Rimini RV rentals. You can even make a detour via Bologna and help yourself to generous heaping of lasagna, prosciutto and Parmesan cheese. The other great part about taking your motorhome rental to Florence is that you will able to spend as much time as you wish in the city which gave birth to the Renaissance. Be sure to stop by the majestic Galleria dell’Accademia where Michelangelo’s ‘David’ is housed. Another must see is the historic Galleria degli Uffizi. Even if you’re not an art person, you’ll enjoy seeing the ‘Birth of Venus’ by Botticelli and the ‘Annunciation’ by Da Vinci.